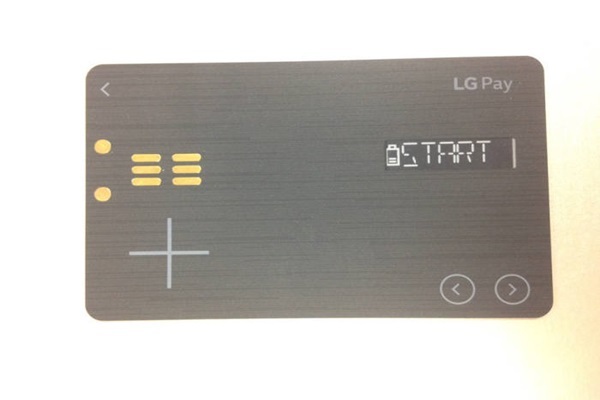 LG Electronics’ mobile payment solution called LG Pay ‘White Card’ has finally revealed itself. LG Electronics had been working hard not to leak any information to outside by not affirming or denying truth of White Card until now. After looking at actual ‘White Card’, which is LG Pay payment media, on the 27th, its shape is very similar to a normal credit card. There is not much difference in thickness either. LG Electronics had designed it so that not only one can make a payment at a normal retail store, but he or she can also withdraw money from ATM with it. It had applied behavior of credit card users as it is to it. This can be seen as LG Electronics’ strategy to induce elder people who are not familiar with Smartphone payments and introduce group of people that tend to spend more money than others. Customers can select which credit card they want through a separate liquid crystal display on White Card. When power button is on, a sign that says ‘START’ comes on and LG Electronics also added LOCK function. One can select a card that has most benefits at a particular store through a liquid crystal display. Even point savings can be done when payments are made. Because this card is implemented as an electronic device, it needs a separate charging function. Charging terminal is marked on the left side of White Card, and it can be charged by using a ‘White Card Charger’. LG Electronics is planning to introduce this charger along with White Card. According to IT, finance, and distribution industries, LG Electronics had recently pre-ordered about 50,000 White Cards for White Card’s release. It is currently discussing with a South Korean Smart Card business about mass-production of White Card. LG Electronics is currently testing payments with many VAN companies for payment linkage and is planning to introduce it at MWC 2016 that will be held next month. Although LG Pay is going to support IC payment along with MS, LG Pay that will be introduced during first half will only support MS transactions. As LG Pay is expanding its denotation as a viable challenger to Samsung Pay, many financial companies will participate one after the other. With Shinhan Card and KB Card already had joined as partners, Lotte Card had also joined LG Pay recently and they are testing LG Pay with a goal of releasing it in March. “We have decided to link Lotte Card to LG Pay.” said a representative for Lotte Card. “There is a high chance that other card companies will join LG Pay very shortly.” It is heard that Hyundai Card and BC Card are also contemplating about joining LG Pay. 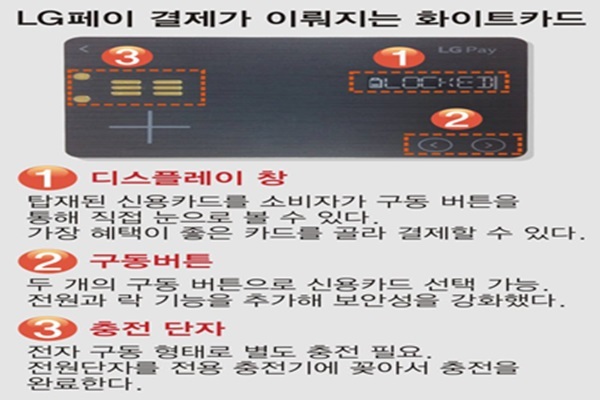 As White Card is introduced, competition between Smartphone-based Samsung Pay and card media-based LG Pay has begun on full-scale. To this, LG Electronics announced that it cannot show exact date of LG Pay and which companies it is working with.